For press inquires, please contact DRA. “Something for everyone” is an old cliché that gains new relevance in today’s real estate marketplace. Never before have home designs, community plans and prices been as carefully targeted as they are today, and baby boomers have been among the prime beneficiaries of this trend. boomers prefer to buy newly constructed homes, townhomes and condominiums because they can thereby avoid irksome and expensive repairs and renovations. D.R. Horton, pioneer of active adult communities for those 55 and better in the Chicagoland area, is presently developing Carillon Club in Naperville and Carillon at Cambridge Lakes in Pingree Grove, its sixth and seventh 55-and-better communities in the Chicagoland area. “Sales continue to be brisk in these communities where one-level living and a recreational lifestyle enable baby boomers to reinvent their lives and their surroundings in new, exciting ways, with more convenience and varied opportunities to make new friends and try new interests,” says Chris Naatz, vice president of Sales for D.R. Horton’s Chicago Division. “Many buyers desire the open, attractive floor plans and ease of maintenance that these communities offer. In these communities, buyers typically can find different housing styles, including condominiums, townhomes and single-family detached homes of varied sizes. Some buyers want to downsize, while others choose larger homes with basements to accommodate big family gatherings and large groups of friends. Another type of community that is attracting baby boomers along with a variety of other age groups is condominium living. Optima, Inc. has created a distinctive niche in this market and pioneered in the development of green roof sky gardens, and most recently has developed Optima Chicago Center in prestigious Streeterville. Optima Chicago Center is a contemporary 42-floor luxury rental apartment building with architectural panache and state-of-the-art recreational amenities. In addition, Optima offers equally impressive rental and for sale condominiums in Phoenix, Arizona, which attracts many Chicagoland snowbirds. 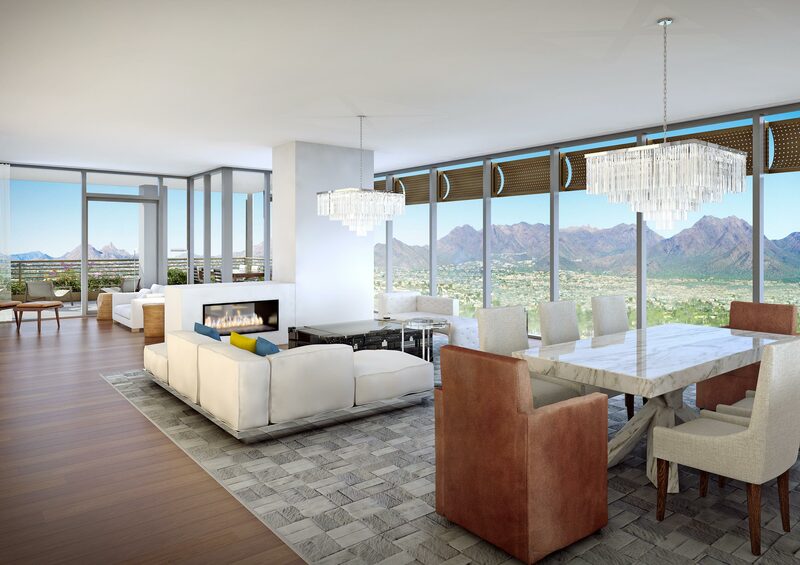 Optima Kierland is a 12-story building with four towers, panoramic views and large outdoor living spaces for every residence. Amenities include a 16,000-square-foot fitness center, rooftop garden with heated pool, fully equipped Residents’ Club, sports bar, basketball courts, hydro steam sauna, squash court, yoga room and more. One, two, three, or four bedrooms and penthouse units are offered. The images depicted include artist conception of proposed improvements, homes and amenities in the 7120 tower, and a combination of two homes with custom finishes in the 7120 Tower. Additional costs and fees to customize and combine. All sales subject to receipt and acceptance of the ADRE Public Report. Public Report is available at the Arizona Real Estate Department’s website. Pricing and floor plan design are subject to change without notice. Optima Realty Inc.
Real Estate Consulting and Sales by Optima Realty, Inc. A licensed Arizona Broker ADRE #CO548458000. Plans and elevations are artist’s renderings only, may not accurately represent the actual condition of a home as constructed, and may contain options or furnishings which are not standard. We reserve the right to make changes to pricing, floor plans, specifications, dimensions and elevations without prior notice. Stated dimensions and square footage are approximate and should not be used as representation of the home’s precise or actual size. Any statement, verbal or written, regarding the square footage size of any home has been estimated and should not be construed to indicate certainty. Garage and/or parking space sizes depicted may vary from the final product and may not accommodate all vehicles. This website and all materials contained herein, including but not limited to floor plans, images and elevations, are copyrighted and may not be distributed, modified, or reproduced in whole or in part without prior written permission. This website is provided as a service to Internet users and its use is a privilege to the viewer. All information is provided without warranty of any kind, either express or implied or for non-infringement. Access and use of the website and all company links are subject to the terms and conditions set forth herein and to all applicable laws regulating the use of the Internet and those relating to the use of information. The use of this website is also subject to all applicable laws involving copyrighted materials and intellectual property. Site plans, community maps, photos and/or computer generated renderings have been posted on this site for illustration purposes only. All site plans, community maps, photos and computer generated renderings shown are conceptual in nature and are merely an artist’s rendition. They may not accurately represent the actual condition of the item being represented. All photos/videos shown depict the community or home as of the date taken. All Illustrations are solely for illustrative purposes and should never be relied upon.